One of the first four-year degrees launched by what is now Middle Georgia State University was a Bachelor of Science in Information Technology. Nearly two decades later, IT makes history again as one of Middle Georgia State’s first graduate programs. "It's a significant milestone," said Dr. Alex Koohang, dean of the School of Information Technology. "It shows we have been innovative and flexible over the years and providing quality instruction to our students. Many of our graduates have been asking when we will get a master's degree. That time has arrived." Middle Georgia State, which officially became a University on July 1, 2015, launched graduate degrees in IT and Nursing this spring. The University expected an initial enrollment of 30 students between the two programs, both of which are online. But the number of applicants beat expectations and the University ended up admitting 47 students - 33 in IT and 14 in Nursing. Dr. Kevin Cantwell, Middle Georgia State’s interim provost who was interim dean of Graduate Studies until recently, credits the University’s success in creating two attractive programs to its adherence to the results of a regional needs assessment. The Southern Association of Colleges and Schools Commission on Colleges (SACSCOC) authorized the University in December 2015 to begin admitting students to the first two graduate programs. Middle Georgia State’s Master of Science in Information Technology has tracks in information security/digital forensics and health informatics. The Master of Science in Nursing prepares nurse practitioners in adult/gerontology and acute care. Sarah Hollifield, 23, was among the first to enroll in the IT graduate program. Hollifield picked up her bachelor’s degree from Middle Georgia State in 2015 and was that year’s Academic Recognition Day Scholar. Among many other accomplishments, Hollifield drew attention for her talent as a game developer. She considered applying to an online master's program at Georgia Tech but once Middle Georgia State became a university, Hollifield knew she would stay. Dr. Kevin Floyd, who was one of the former Macon State College’s first IT graduates, is now master's degee program director for the School of Information Technology and directing the master’s degree program. Koohang said the master’s degree is unlike any offered by any other University System of Georgia institution. Among its unique factors is the fact it is fully online, catering to the adult working population. The program was designed with regional economic and employment needs in mind, particularly those generated by Robins Air Force Base. Hollifield’s career goals include working in private-sector software and application programming development and, eventually, teaching. 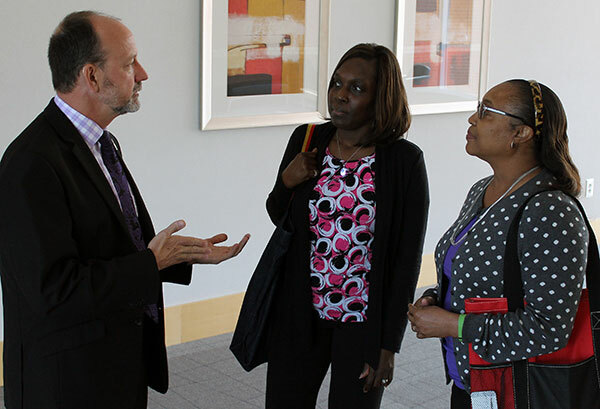 Photo: Dr. John Girard, IT professor, talks with two of the first students to enroll in the graduate program, Yulonda M. Banks, center, and Estella Dennard.